Indian Brigadier SK Sengar greeting his Chinese counterpart at the Border Personnell Meeting held at Natu La on Sunday, a photo by Chindits on Flickr. A Border Personnel Meeting (BPM) between India and China was held at Natu La on Sunday. Uniformed members from both sides attended the BPM organized by India. 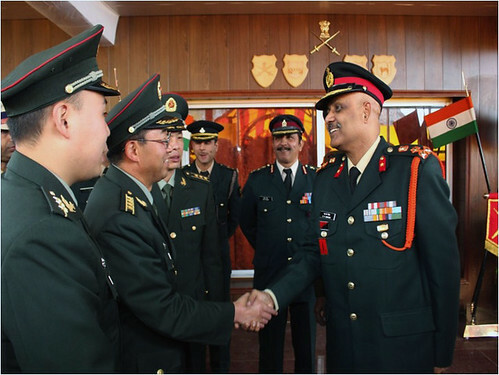 While Brigadier SK Sengar led an 11-member Indian delegation, a senior PLA Colonel (equivalent to a Brigadier) led the 11-member PLA delegation. Various issues were discussed in a warm, cordial and friendly atmosphere. Mutual cooperation and maintenance of peace on the borders was also discussed during the meeting. A cultural exchange programme followed the meet from both sides. BPMs between the two armies serve as vital platforms for discussing local issues and enhance mutual understanding and confidence to strengthen peace in various sectors.